Today, all three of my children are playing happily (I assume) at Wet n’ Wild, the popular water park in Hawaii, located on Oahu. They’re lucky enough to visit the water park through their summer camp, and it’s a trip they look forward to all summer long. The hotel pool has gotten a bit boring: Let’s face it: You can only take so-much of the hotel pool. And, there are times when even the beach seems ho-hum. 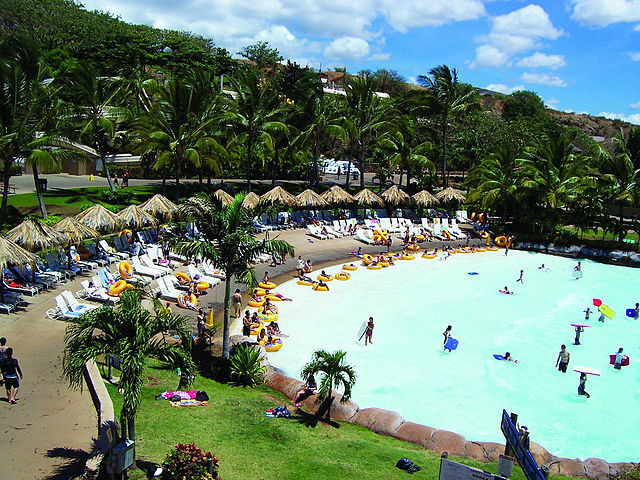 If you’ve run-out of water activities to entertain your family, then Wet n’ Wild is a great place to visit. It features more than 25 attractions, and the venue is only 17 years old (which is young in “water park years”). Between the slides, the water playgrounds, and the wave pool, you’ll never get bored (and more importantly, your children will be enetertained for day). The Island Racers are a group of four racing slides that take guests head-first on a racing mat into an enclosed tube, then loops them into a four-lane downhill speedway. You’re an Adrenaline Junkie: Attractions include slides like the Shaka, which plunges guests down a sheer 36-foot drop almost vertically into a u-shaped slide to experience a zero-gravity sensation and the Tornado, which catapults guests through a swirling 45-foot funnel into the eye of the storm and into calmer waters. The Island Racers are a group of four racing slides that take guests head-first on a racing mat into an enclosed tube, then loops them into a four-lane downhill speedway. You Have Little Ones: It’s not always easy to keep the little-ones (ages 4-7) busy, but you have lots of options at the water park in Hawaii. The park features tamer attractions like Water World Playground, a multi-level children’s area that is full of dumping buckets, kid friendly slides and interactive water cannons. Or, you can try Hawaiian Waters, a 400,000-gallon wave pool where you can body board on machine generated waves similar to the waves on Waikiki Beach. You Want to Surf a Monster Wave: If you want to experience the thrill of surfing MINUS the danger of getting scraped by coral reef, you can always try Da Flowrider. This pay-per-play premium attraction is Hawaii’s only simulated surfing experience. Regardless of age or skill, guests can experience the thrill of catching and riding a 40 foot continuous wave. You Don’t Want to Spend a Small Fortune: Sure, you’re on vacation and assume you’ll spend a bunch of money. But, the water park IS super-expensive (either that, or I’m cheap). A ticket for anyone under the age of 65 and 42-inches or taller will cost you $49.99. Tickets for those over the age of 65 or under 42-inches tall get in for $39.99. And, parking is $8.00. So, for a family of four, with two adults and two children (including parking), you’re looking at spending $187.96. And, that’s BEFORE food, etc. So, you could easily spend $250 for a day at the water park. Only you can decide if it’s worth the money. HOWEVER, you can choose a visitor combo package that will knock the price down considerably. Click here for details. You Have a Water Park Close to Home: I’ve been to a lot of water parks, and, frankly, if you’ve seen one, you’ve seen them all. Wet n’ Wild is no different, really, from most of the water parks across the country. So, if you have access to one at home, you may want to spend more of your time at the beach (which, I’ll assume, is a little more elusive). Hawaiian Waters is a 400,000-gallon wave pool where you can body board on machine generated waves similar to the waves on Waikiki Beach. You Aren’t Comfortable in the Water: If you don’t feel completely at-home around water, you may want to stay away from the water park. Although there are lifeguards stationed throughout the park, your safety is priority. Accidents happen, and you don’t want a near-miss or an emergency to be the most significant memory you bring home! You Want to Stay Close to Your Hotel: Kapolei isn’t nearly the far-side of the world, but it IS a 30-minute drive from Waikiki. If you don’t have ground transportation, it could cost you a bundle to rent a car or take a taxi to the water park. Interestingly enough, the water park has a car rental and admission package to help out. Click here to learn more. Or, talk to your tour professional at Hawaii Aloha Travel to discuss ways you can incorporate a trip to Wet n’ Wild into a day of Oahu activities. The Wet n’ Wild experience can be fun, exhilerating, and exciting. But, it can also be expensive. So, consider the above criteria when deciding if the water park in Hawaii is right for you!